Previously we discussed that the speed of a DC motor is dependent on the voltage at its terminals. In order to automatically control the DC voltage to our motor we could use a complicated DC power supply with a voltage control input. However, the easy way is to create a square wave at a constant frequency with a varying duty cycle. The duty cycle of a square wave is a ratio of the on time versus the total time of the period. A square wave with equal on time and off time is said to have a duty cycle or duty factor if 1/2. Likewise, a square wave with a on time of 1mS and a off time of 3mS is said to have a duty factor of 1/4. The equation to find the duty cycle or factor of a square wave is given below. Furthermore, a square wave with a duty cycle of 1/2 has an average voltage of 1/2 of the peak voltage. The average voltage of a square wave is the product of the duty factor and the maximum voltage. All of this to say that a pulse width modulated (PWM) square wave can be used to control the speed of a DC motor. A PWM square wave is one in which the width of the on time is controlled by some controller. If we take the H-Bridge from the last discussion and replace the switches with transistors we can now turn these transistors on and off at a high frequency to control not only the direction of the motors but also the speed. This switching frequency is at a high enough frequency such that the motor windings act like a filter and the voltage measured inside the motor would be the average voltage of the PWM waveform. One additional, typically unforeseen, issue with this circuit is the inability for a simple circuit to turn on and off transistors M1 and M2. These are called high side switches because they are connected to the highest voltage in the circuit. Because the driver must insure that the gate to source voltage is at least 4V the voltage between the gate and ground is much higher than 4V. This requires a special driver called a high side driver. These drivers are, many times, package together with a “low-side” driver such that the combination is able to turn on and off all four (or at least two) transistors inside one chip. Because we are turning on and off an inductor we will also have problems with our transistor maximum reverse voltage. Recall that inductance is the resistance to a change in current. When we turn our motor off and back on this is a large and fast change in current which causes a very high voltage to be generated by the inductor (motor winding) and seen at the drain to source junction. This very high voltage can be on the order of 100V and could easily damage the transistor. In order to protect our transistor fro damage we install another circuit on top of our transistor H-Bridge circuit called a snubber circuit. This snubber circuits snubs out the high voltage spikes and keeps the transistor from harm. One type of snubber circuit is shown below as it would be applied to the MOSFET. The calculations of appropriate values of the components in this snubber circuit are outside the scope of this course. 1. The on time of a waveform is measured to be 0.001mS and the off time is measured to be 0.002mS. Give the duty factor. 2. The duty factor of a waveform is 45% and the maximum voltage is 14V. What is the average voltage of the waveform. 3. It is difficult for a simple circuit to turn on a high side switch because the ________ is not connected to ground. 4. The frequency of a PWM waveform should be high enough so that __________________. 5. Because a motor is an inductive load it resists a change in current so when the transistor turns on and off the voltage level may spike and exceed the rating of the transistor. A ________ circuit can be used to combat this problem. I don’t know if it’s something you address in the audio that hasn’t been posted yet or not, but I can’t seem to find any mention of #3’s question regarding something not being connected to ground. 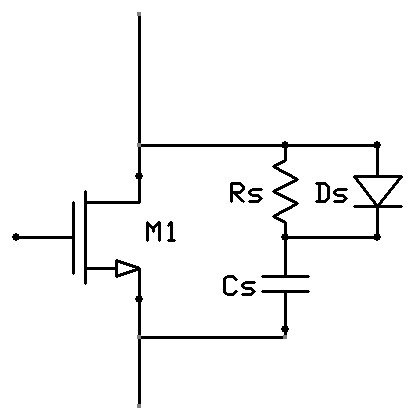 The MOSFET needs between 2 and 4 volts at the Gate-to-Source junction to turn on. Since the high side MOSFET is not connected to ground that voltage, which must still be measured between the gate and the source and must still be at least 4V, will be much higher and much more difficult to generate. So because the MOSFET is not connected to ground the voltage required to turn it on is much higher. So, to answer the question look at the low side MOSFET and determine which lead is connected to ground, compare that to the high side and see if you can determine the answer to the question.